I’m taking part in the Ceredigion Art Trail this year. The Trail runs from 16th to 31st of August and features over 70 open studios and exhibitions. Painters, sculptors, quilters, makers, photographers and printers from all over the county are taking part. It’s a fantastic opportunity to get a wider audience for my new paintings. 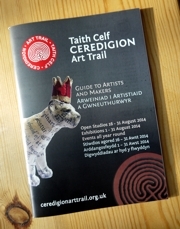 The Trail Guide, available free from many local venues, including Tourist Information Centres, and on the Trail website at http://ceredigionarttrail.org.uk/, has a directory of all the artists and makers taking part, including details and pictures of their work. So, together with the maps and calendar of studio opening dates and times, you can choose which artists interest you and plan your very own trail route, all in the beautiful countryside of West Wales.